Buildings to the far east, of campus are located along Adams and Fairfax streets. Cook Hall is home to the International Education Center and houses a number of departments dealing with global curricula, including the English Language Institute and the Foreign Languages Media Center. 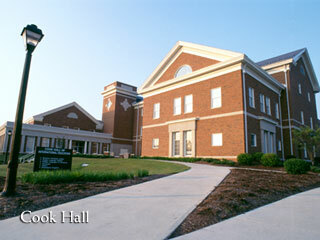 The Departments of History, Geography and Foreign Languages and Literatures are also located in Cook. The building, which features a multimedia facility and GIS lab, is ideal for workshops and conferences. Fact: Radford University has offered study abroad programs for at least 30 years with more opportunities available to students each year. A study experience in a different country fosters awareness of other cultures, deepens awareness of one's own culture and can help students develop future career paths. The International Education Center (located in Cook Hall) is the place to start for RU students seeking an enriching international experience.